My apartment is cozy with a magnificent view of the Andes mountains and the city (17th floor). - Fully-equipped kitchenette with fridge, microwave, oven, china, glasses, silverware for 6 people. - Fantastic sunset views on the Andes. -Walking distance from many cultural and recreational places and amenities. I am Belgian and came to South America when I was 25. I fell in love with Chile and Santiago, and I have now been living in this wonderful city for 17 years. I enjoy outdoor adventures in Chile's amazing nature, as well as sharing good moments with friends and meeting new people. 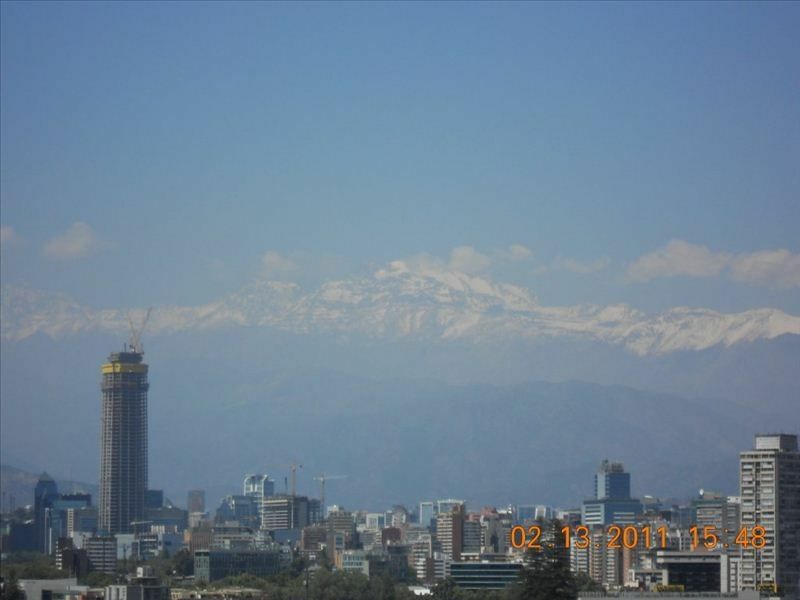 I bought this apartment in 2011 as I found its direct surrounding very charmful, as well as for its unique view over the city and the Andes. The apartment is a hiding place, dominating from a 17th floor in the most en vogue area of Santiago, literally surrounded by restaurants (Patio Bellavista and others) and theaters. It is also well located for strolls in the close-by Cerro San Cristobal (the city 's largest park), and Parque Forestal, which leads to the historic center of the city. It is 3 blocks from the Baquedano metro station. Breathtaking open view t othe Andes mountain range and the city, one of the best features of the apartment. Best view, best location, best choice in Santiago!! Spent 12 nights in this gem of an apartment in the heart of Barrio Bellavista. From the balcony, we could see San Cristobal hill, downtown Santiago, and the amazing Andes. Within minutes, we walked to San Cristobal hill, Pablo Neruda's home, 100s of restaurant choices, and the metro. There are very few places to stay with a pool and a view so we feel so lucky to have chosen Valerie's place. She provides you with excellent travel tips. We took two tours from BellaBike (their info booth is right around the corner). One tour was to Concha y Toro and the other was to the Maipo Valley and hot springs in the mountains. We loved hearing the sounds from this city that never sleeps. Not sure that anyplace else would've been quieter. Highly recommended!!! This apartment was everything Valerie described. Clean, beautiful views, perfect location for walking all around the cool parts of Santiago. Valerie continued to be helpful throughout our stay with advice on how to navigate Santiago. We would definitely stay here again and have recommended this apartment to all of our friends and have encouraged everyone to go to Chile! Had a great 4 days in Santiago, the condo was as described, well equipped and located in a happening area of Santiago. The owner was helpful with local knowledge and prompt with emails. The only downside that it was a little hot in the mornings when the sun shone in, but if you are going out early this is not a problem. We agree with the other positive reviews already provided. The views of the Andes are superb! It is a convenient location and the area is filled with wonderful restaurants and bars. It is within walking distance of the wonderful city park with a funicular that goes to the top with incredible views of the city. It is close to the subway system and access to the sights of Santiago. Valerie was very helpful. Great stay. We would come back! Wonderful view of the Andes!! We were there five days and loved it. Easy walk to everything, including public transportation. Perfect for local atmosphere and shopping, super dining and great fun. Lively neighborhood with restaurants, outdoor cafes and music. Unit is clean, tidy, very well equipped and comfortable. Highly recommend Valerie's hospitality and unit! We stayed at Valerie's property for 8 days. It was clean, in a great neighborhood, and a perfect pivot point to travel around the city and outlaying areas. The views each morning are outstanding, and the patio doors in each room allow the fresh air to flow into the apartment. The pool was clean and never too busy. There are plenty of restaurants in the area, and small grocery stores within walking distance.The best part of all, was Valerie answered all our questions and provided us with lots of information about Santiago and the surrounding area. The underground system is close, convenient, and inexpensive. This a great place for couples or even up to 3 friends. We speak Spanish, French and English. Please always ask for a quote as prices vary according to length of stay and cicumstances.